Paramhansa Yogananda described the AUM vibration as the Divine Mother. He said that one must go through AUM/Mother in order to reach cosmic consciousness. Here he goes more deeply into the process of becoming one with AUM, and in this instance compares AUM to the Divine Mother as Mary, the Mother of Jesus. “Once the mind is interiorized, and withdrawn from its identification with the world and with the body, the inner light comes into clear and steady focus. The inner sounds become all-absorbing. Aum fills the brain; its vibration moves down the spine, bursting open the door of the heart’s feeling, then flowing out into the body. The whole body vibrates with the sound of Aum. “Gradually, with ever-deeper meditation, the consciousness expands with that sound. Moving beyond the confines of the body, it embraces the vastness of infinite vibration. You realize your oneness with all existence as Aum, the Cosmic Vibration. “This state is known as Aum samadhi, or union with God as Cosmic Sound. Aum is that aspect of the Christian Trinity which is known as the Holy Ghost, or Word of God. “By still deeper meditation, one perceives in the physical body, underlying the Aum vibration, the vibrationless calm of the Christ Consciousness, the reflection in creation of the unmoving Spirit beyond creation. “In ancient spiritual tradition, the Christ Consciousness is spoken of as the Son. For just as, among human beings, the son is a reflection of the father, so in cosmic consciousness the Christ–in Sanskrit called Krishna, or Kutastha Chaitanya–reflects in all things the consciousness of God, the Father, beyond creation. “By ever deeper meditation, one expands his awareness of the Christ Consciousness beyond the limits of the body to perceive his oneness finally with the Christ Consciousness, which underlies the manifested universe. “By deeper meditation still, one goes beyond creation and unites his consciousness with that of the Father, Satchidananda, the vast ocean of Spirit. “In these progressive stages of realization are discovered, in reverse order, the three aspects of the Trinity: Father, Son, and Holy Ghost. “In the same way, Krishna in India was really Jadava the Krishna–or Christna, as it is sometimes written to show that the meaning is the same. “Jesus was a master. He had attained Christ Consciousness. Anyone who attains that state of consciousness may justifiably also be called the Christ, for he has dissolved his ego in the infinite consciousness. “Aum, the Holy Ghost, is also referred to in ancient traditions as the Mother, for it represents the feminine aspect of God. “The Roman Catholic Church teaches that one must go through the Mother to reach Christ. 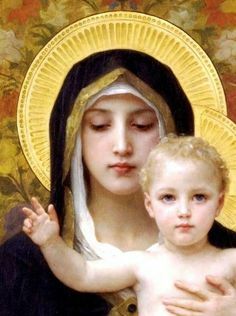 To them, of course, the Mother signifies Mary, the mother of Jesus. For all that, the truth is there, though far deeper than the generally accepted understanding of it. “For, to reach Christ Consciousness, you must first unite your consciousness with Aum, the Cosmic Vibration. This entry was posted in yogananda. Bookmark the permalink. Gracias Guruji porque gracias a tí amo más a la Madre Divina y la siento más en mi corazón.